Commence strategic bombing of the moon! Friday morning at 4:30 AM Pacific time, NASA is going to slam the Centaur upper stage of a big rocket into the moon at something like four miles per second. At that speed, I could get back to where I grew up, in Oklahoma, in less than four minutes. 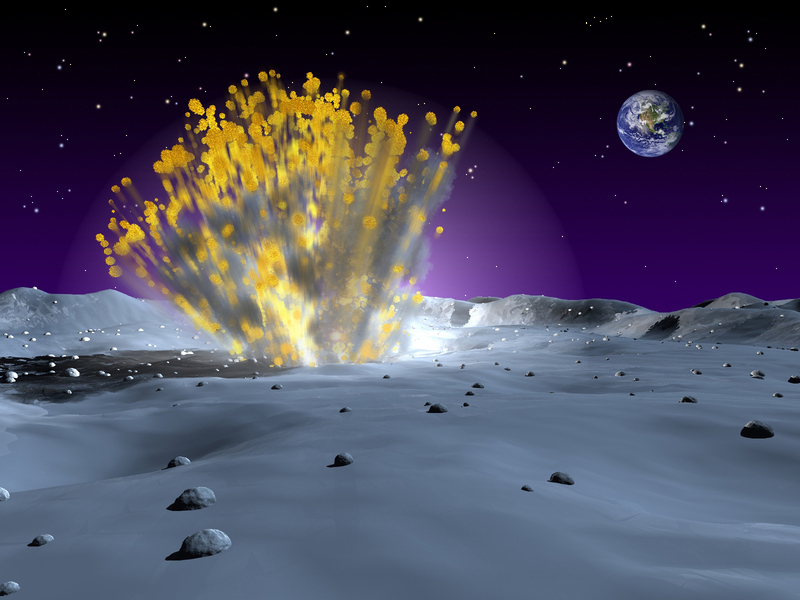 The reason NASA is bombing the moon is to see if there might be water ice in one of the permanently shadowed craters at the lunar south pole–potential prime real estate for future manned missions. Following a bit behind the rocket stage is the LCROSS (Lunar CRater Observation and Sensing Satellite) probe, which will search for signs of water as it flies through the debris plume. LCROSS is also going to send us pretty pictures before it slams into the moon just four minutes later. Big telescopes across the planet will be watching, and lots of little ones as well. The debris plume is expected to be about 6 miles tall, which means it should be visible in telescopes 10-12 inches in diameter or larger. I don’t have a scope that big, but I have a friend with a 16-inch Dob and I’m off work Friday, so we’re going to put in a full night of observing and cap it with an impact watch. It’s worth pointing out that the Centaur is going to hit the moon with considerably more kinetic energy than anything manmade has before. Nobody really knows for sure how this is going to shake out–not just the water part, but the debris plume itself. There may be folks with 12-inch (or even 16 inch!) scopes who see nothing, or on the flip side it might be visible to smaller instruments (you know, the kind I’m usually yakking about). So it’s probably worth getting up for if it will be visible from your location (sorry, Europe and Eastern seaboard). If not, NASA TV will have live and streaming coverage. NASA has a pretty great page about the mission here, with loads of info that you’ll probably find useful whether you plan to observe the impact from your backyard or your sofa. Hey folks, thanks for your patience. Missions will resume shortly. In the meantime, here are a couple of astronomy music videos. The first is from Brian Engh, who, when he drops some science on you, drops actual science. If you liked that, get on over to dontmesswithdinosaurs.com and get your face rocked off, especially by his crocodilian gangsta rap and Thundering Earth Beast Technique. Our second installment pays homage to Carl Sagan and the monumental Cosmos series. Featuring Stephen Hawking. Much cooler than you are probably expecting based on that description. Hey, this isn’t to announce that I’m going to stop blogging, it’s to acknowledge that I have effectively stopped already. But it’s just temporary; last week I was at a conference in England and this week is my big lecturing push in Gross Anatomy. With any luck I’ll be back to normal–and back to blogging–next week. In the meantime, Jupiter is high and pretty every night, and the moon is moving toward full, so you can get some lunar exploring in now and look forward to chasing faint fuzzies in a week or so. I’ve got some more missions in mind so do stay tuned. Also, check out the excellent observing reports that David Delano has been leaving as comments, and feel free to post your own. You are currently browsing the 10 Minute Astronomy blog archives for October, 2009.